Staying hydrated is important all the time, but this is especially true if you work out. And when it comes down to it, CamelBak’s Podium Big Chill bottles are fantastic. Today, you can grab a trio for just $20. 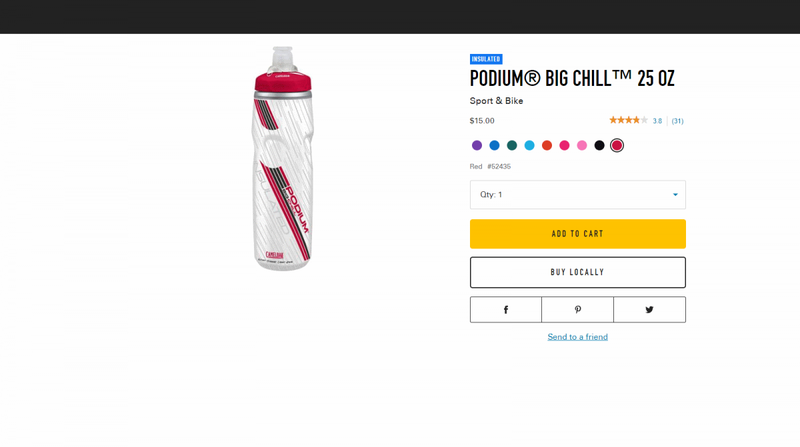 If you’re not familiar with CamelBak’s bottle lineup, here’s the quick and dirty: they have the Podium, which are uninsulated 20 ounce bottles; the Podium Chill, which are insulated 20 ounce bottles, the Podium Big Chill, which are insulated 25 ounce bottles, and the Podium Ice, which are highly insulated 21 ounce bottles. But here’s the thing: CamelBak recently redesigned its bottles to work better for cyclists—the older design was kind of off in a bottle cage on a bike. The new design works much better in that scenario. Because of the redesign, however, they’re knocking the price on the older design. So you can grab three of the 25 ounce Big Chill bottles for just $20 if you use the coupon code 3FOR20 on CamelBak’s website. The bottles come in nine different colors, and it appears they’re all still in stock at the time of writing. If you’re in the market for some new hydration equipment for the gym, on a run, or just for general use, these bottles are excellent. They hold a lot of water, keep it cold for twice as long as uninsulated bottles, and also look great.